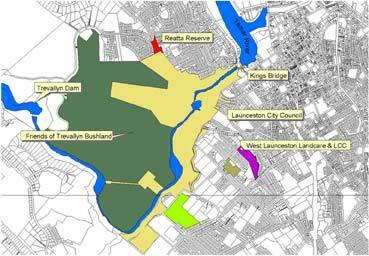 The Friends of Trevallyn Bushland (FOTB) are a Wildcare group working together in the Parks and Wildlife Reserve area adjoining Cataract Gorge near central Launceston (pictured in dark green). FOTB are working together to undertake weed control, restore remnant bushland, undertake seed collection and native plant propagation and learn about the many species of native flora in the reserve. Regular educational walks explore the reserve, highlighting the flora values of the reserve. Recent activities have included: control of Gorse and Spanish Heath, a Spring wildflower walk and a native plant propagating class. Contact the Parks and Wildlife office on 6336 5312 (during business hours) for upcoming activities or check the TVWS website for “News and Events” calendar.